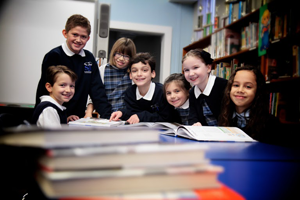 Formal foreign language studies begin in 4th grade with introductory classes to the sights and sounds of the Spanish language and continues through 5th grade. Spanish cultures and customs, along with an introduction to conversational dialogues, are presented to these early learners. Having received this prerequisite introduction, grade 6 students are prepared to begin instruction with basic vocabulary and grammar including reading and writing within the language. A deeper exploration of the culture and customs furthers students’ exposure with a second language. During 7th and 8th grade, students are fully immersed in the classroom engaged in the curriculum taught in secondary schools. 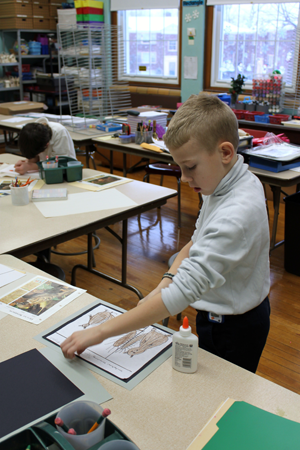 Art is offered to all students at St. Johns from Pre-K through grade 8. Students learn fundamental design and drawing principles and employ various mediums, including pencils, watercolors, paints and clay, among others. Students also study art history and examine various artists, illustrators, and periods. Our bright, inviting art studio is the perfect setting to uncover the artistic talents in everyone. A two-pronged approach is essential in delivering computer and technology curriculum to students. 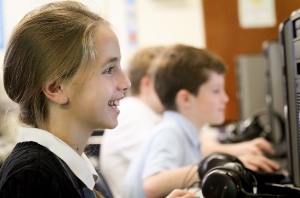 Students are taught how to use technology to access information and data, as well as how to use technology to present and deliver their findings. Our computer lab houses over two dozen computers and an Interactive Board to provide every student direct access to technology during formal instruction. Students will become proficient in using Google GSuite Applications and Microsoft Power Point, Excel and Word programs. Authentic tasks requiring the use of these tech tools requires students to be fluent with these programs. Additionally, students regularly use our Wi-Fi Internet system and educational software to research and to complete tasks to sharpen their technology skills. A recent renovation of the school library has provided a remarkable space that fosters critical thinking and provides an environment equipped to meet the needs of the 21st century learner, while also maintaining fundamental library skills. Starting in Pre-K, our students receive formal library and media instruction through grade 6. An extension of our literacy program, students are exposed to beloved authors and various genres to further their love of reading. As they move on through the grades, research skills and evaluating reliable sources are just some of the topics delivered during formal instruction. Our 7th and 8th graders use the skills they’ve mastered when writing extended research papers as part of their English-Language Arts coursework. The joyous sound of music echoes through the hallways of St. John’s throughout the day. Whether vocalists or instrumentals, our music department exudes its unique rhythm and beat that makes toes tap. From Pre-K to 8th grade, students are immersed in numerous styles, periods, composers and performers. From traditional and classical to musical and rock, students are bound to discover something that speaks to their inner musician. Moreover, an introduction to the recorder begins in grade 3 and continues through grade 4, while students in grade 6 receive formal instruction on keyboards. Our students’ talents are further showcased during our Christmas and spring concerts. 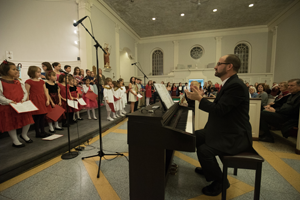 Additionally, our school has two choirs, including a Children's Choir and St. John's Singers who sins during school liturgies and special events. Health and wellness are the emphasis of our physical education classes. Students engage in individual strengthening and cardio exercises to maximize their personal fitness. Additionally, formal instruction in traditional team sports, including volleyball, floor hockey, and basketball are presented to foster adherence to rules and team building opportunities. From the start in Pre-K and on through, well-being and fitness are paramount to this program.